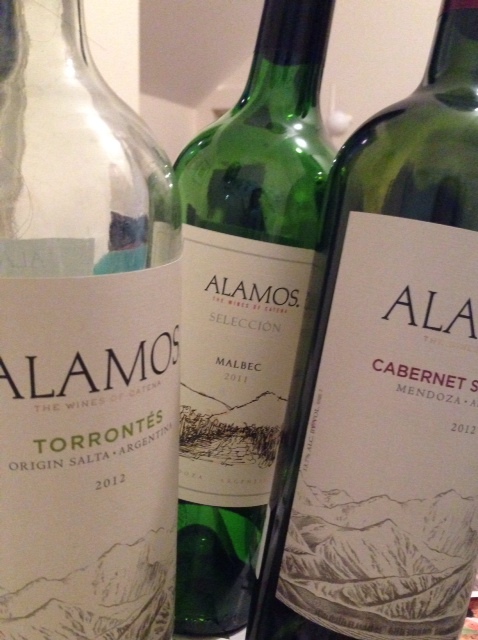 We’ll begin with the cream of the crop: Alamos 2011 Seleccion Malbec ($20 a bottle). This is a bottle of wine to savor, and that’s exactly what I did. Over several days, I enjoyed a glass of malbec with a traditional chicken dinner, but this rich, velvety wine is best served with something similarly exotic to Argentina: salad of roasted beets with carne a la masa (marinated beef baked in dough). The wines of Alamos are a trusted favorite of mine, and I really enjoyed the 2012 Torrontes, perhaps because the aroma of jasmine always makes me happy, or because it’s a great wine to serve with appetizers that include some goat cheese and something spicy. This wine is fruity and different, and is priced at $13, making it an affordable table wine to enjoy or bring to a dinner party as a hostess gift. Finally, my third Alamos wine tasted: Alamos 2012 Cabernet Sauvignon ($13) of which you can taste the dark berries and spice. This is a bottle to open after you’ve just took a leg of lamb out of the firepit. It’s a medium bodied wine with a low tannin structure, so drink it now. I enjoyed this bottle with dinner of arugula salad and pulled pork with homemade BBQ sauce.